Thousands of Scientologists from more than 30 nations converged in Copenhagen’s city center to celebrate the dedication of the Ideal Advanced Organization and Saint Hill Europe (AOSH EU). 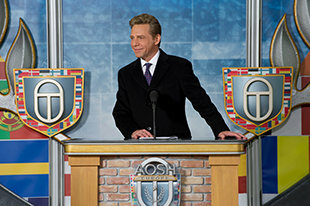 The AOSH EU is a multilingual Organization that delivers the Advanced Levels of the Scientology Bridge to Total Freedom for every Scientologist across the continent. The Ideal Advanced Organization and Saint Hill Europe was dedicated on February 15, 2014 in ceremonies attended by thousands of Scientologists from across the continent. All seven stories of AOSH EU’s home have been transformed into a fully Ideal facility to service the multitudes of Europeans moving up the Bridge in the Golden Age of Tech Phase II. Mr. David Miscavige, Chairman of the Board Religious Technology Center, led the dedication of the new Ideal Advanced Organization and Saint Hill Europe. Mr. Miscavige was joined by thousands of continental Scientologists gathered on Jernbanegade Street in the heart of Copenhagen. The grand opening commenced with a high-spirited performance of AOSH EU’s beloved anthem “European Gateway to OT”. Europe’s Advanced Organization and Saint Hill reception extends a pan-European welcome to all Scientologists crossing the threshold of the gateway to OT. AOSH EU staff hail from nations across the Eurasian continent and deliver processing and training services in dozens of languages. The Bookstore serves Scientologists from nations across Europe and so provides the materials of the Golden Age of Knowledge as well as student materials for Golden Age of Tech Phase II training in all translated languages. AOSH EU is the ideal home for every European Scientologist to attain spiritual freedom. All seven floors are devoted to the single purpose of seeing that all reach their goals for superlative training and the attainment of OT. The training floor begins with the Golden Age of Knowledge Course Room, devoted to study of the Basics Books and Lectures and all other courses on the Routes to Knowledge. The expanded training facilities comprise multiple course rooms spanning an entire floor. As the senior technical org for Europe, AOSH EU graduates the top technical personnel for the continent. At the heart of our Ideal AOSH EU stands the new Solo Technical Division, devoted to seeing all Scientologists across the threshold to Clear and into the realms of OT. The expanded Hubbard Guidance Center encompasses the entire span of the Bridge. Here is delivered every processing level to Clear including the legendary Power Processes. Here, too, Scientologists can reach the upper realms of OT at Audited New Era Dianetics for OTs. Each auditing room embodies Standard Tech and is the ideal, distraction-free environment in which to progress to OT—replete with the special AOSH EU edition Mark Ultra VIII E-Meter. AOSH EU auditors deliver services in more than a dozen languages. The Qualifications Division upholds Standard Tech in this Scientology Golden Age. Its Knowledge Center maintains a complete library of all Source materials of Dianetics and Scientology, as well as general reference works for use in all study. AOSH EU’s Courtyard hosts weekly graduations and a full calendar of events throughout the year. The renowned atrium setting is further home to workshops, conventions and banquets in the name of a Clear and OT Europe. The Office of L. Ron Hubbard symbolizes the fact that AOSH EU upholds the duty and trust with which LRH established this organization as custodian of the upper Bridge and gateway to OT for all of Europe. Originally constructed in 1887, the Church’s historic home neighbors Tivoli Gardens and Town Hall Square. In the process of completely transforming all seven stories to fully Ideal standards, the Church meticulously preserved the building’s distinctive features—most notably the sculptured terra cotta brick façade and the original Pomeranian pine interior millwork throughout. And thousands of Scientologists speaking 27 languages gathered in celebration. 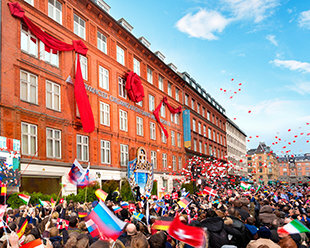 Such was the scene along Copenhagen’s Jernbanegade Street for the dedication of the new Ideal European Gateway to OT: the Ideal Advanced Organization and Saint Hill Europe (AOSH EU). Originally established by L. Ron Hubbard in 1969, AOSH EU is a multilingual Sea Org organization that services Scientologists from the nations of Europe, the Commonwealth of Independent States and the Middle East. The grand opening follows in the wake of the monumental release of the Golden Age of Tech Phase II, which has resulted in exponential numbers of Scientologists ascending the Bridge to the State of Clear with unprecedented speed. Consequently, AOSH EU’s home has been completely transformed into the Ideal Advanced Organization to accommodate the multitudes of Europeans now poised to cross the threshold into the realm of OT. The grand opening of the Ideal AOSH EU represents the first in a new breed of continental Advanced Organizations. The facility boasts a complete Solo Technical Division dedicated exclusively to servicing all Solo Auditors; an expanded Hubbard Guidance Center with dozens of auditing rooms to move Scientologists to Clear and through Audited New Era Dianetics for OTs; and expanded training facilities with multiple course rooms spanning an entire floor. And the fully remodeled, seven-story Nordland Hotel. Ideally situated within walking distance of AOSH EU, the full-service hotel will provide more than 80 guest rooms to accommodate Scientologists arriving for services from nations across Europe.